More than a century later, on the evening of March 12, 2008, a young man named Ron Ciarmello called me with a remarkable story. “I think I have just found the original table from the Wright brothers’ camp,” he said. As a Wright historian, I hear claims like this fairly frequently, and I was skeptical. Between the ravages of Outer Banks weather and coastal people’s practice of “salvaging” unattended property, it was unlikely the table had survived. And even if it had, how could you prove such a claim? Ciarmello had bought the table from a local family who said they had owned it since the days the Wrights had walked on the Outer Banks. But historians need more evidence. Ciarmello had already done some homework. 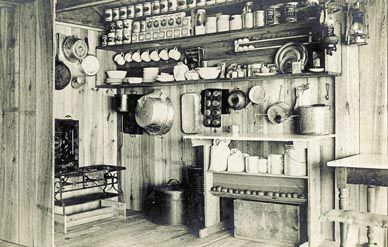 On the Library of Congress’ Web site, he had found a photograph of the shed’s kitchen that showed a corner of a table. “I swear it’s the same table in that picture,” he said. And he had found a second photograph of the table in a book I had written on hidden images in the Wright brothers’ photographs. I asked Ron to e-mail photographs of his table, and when they arrived, my eyes popped. It’s possible, I thought. And if it was the real thing, it was a major find: The Wrights’ diaries and letters recount that the brothers did their writing and sketching on it. In a way, the table was the center of the camp. A few weeks later, I went to Kitty Hawk to meet Ron and examine the table. It was smallish—the top was 39 5/8 by 30 inches. The base had once been part of a small writing table. There was an opening that once held a drawer. The legs were crudely formed on a lathe, each one a little different. Most of the top’s pine boards were attached to one another with tongue-and-groove joints, and I concluded that they had once been part of a crate—the kind the Wrights used to ship equipment, tools, and flying-machine parts from Dayton. Someone had written on the underside of the top “W. Wright, Elizabeth City, NC.” This was probably the shipping address the Wrights had inscribed on the crate. And the writing looked like handwriting on other items the Wrights owned. One piece of evidence convinced me that this was indeed the table from the Wrights’ camp. Two strips of wood were used to widen the top, and they were different from the crate planks: Unlike pine, they had a fine linear grain, typical of high-quality wood, likely spruce. I believe they were from a stash of wood that the brothers reserved for repairing their ash-and-spruce aircraft. Though the Wrights were eager to build the 1902 glider—the one on which they first achieved controlled flight—they appear to have used a little precious flying-machine material to finish the table. I enlisted the help of photo-analysts at the school where I teach, East Carolina University, and we matched the table’s wood grain, leg turnings, and nail holes with those visible in the photograph in my book. We later took the photograph and the table to my documentary editing class, and the students identified tiny holes that could have been left by tacks holding down the oil cloth covering. When we looked at this nondescript piece of furniture, we could then envision the late-night scribbling, pounding of fists, and Eureka! moments. The table became infused with the aura of mystery that surrounds places where humans made history.